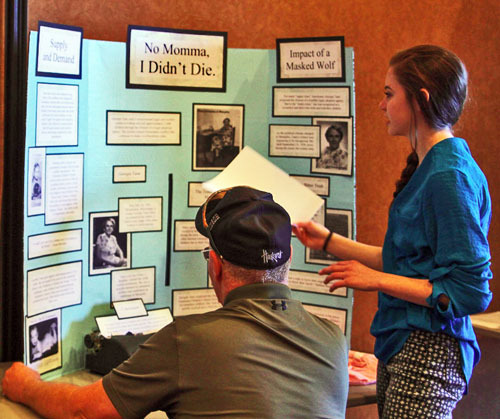 Students from Chadron and Crawford middle and high schools participated in the annual Western District History Day hosted at Chadron State College Friday, March 2. The theme for the competition was “Conflict and Compromise in History.” The top three students in each category will advance to the state competition Saturday, April 7, in Lincoln. Thirteen CSC employees, along with 12 community residents, served as judges for the event. Student members of the CSC Social Science Club Cody Madrigal of Omaha, Neb., Katelynn Mendenhall of Terry, Mont., Andrew Smith of Chadron and Skyler Smyres of Crawford, Neb. helped staff members Christine Fullerton and Whitney Hensley organize on-campus logistics. Laure Sinn coordinated check-in and assisted with registration and the awards ceremony. The judges indicated they reserved the right to not award first place to entries.